Fiber. Like probably most Americans, I know my family does not get as much as is recommended. It's ridiculous, as there are so many great ways to eat it... especially with products like Fiber One out there. I recently received a package including VIP coupons for a free box of Fiber One Cereal, and for a free box of Fiber One Bars, plus a $25 Safeway gift card. That was fun. The tough part was choosing which products to actually get. They've recently changed some of their products, and the descriptions made a tough choice even harder! Fiber One Honey Clusters have a brand new flake! Every one-cup serving is full of tasty honey clusters, antioxidant vitamins A and E, and 13 grams of fiber. 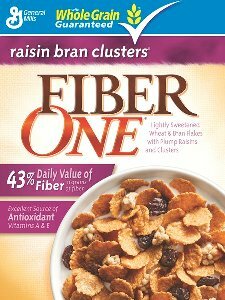 Fiber One Raisin Bran Clusters now contain crispier, lightly sweetened whole grain flakes. With plump, juicy raisins and crunchy clusters it packs 11 grams of fiber and antioxidant vitamins A and E into every serving. With rich chocolate chips and a new and improved taste, Fiber One Oats & Chocolate chewy bars are a good source of calcium and contain 9 grams of fiber in each bar. In addition to the two cereals above, there is also the original Fiber One (which, I confess, has never appealed to me), Caramel Delight, and Shredded Wheat. Choosing a bar was even worse. The new and improved Oats & Chocolate had to compete with Oats & Peanut Butter, Oats & Caramel, Oats & Strawberry with Almonds (which was not on the shelf at my Safeway! ), Oats & Apple Streusel, and Chocolate Mocha. Plus there are 90 Calorie Bars. Yikes. I ended up with the Raisin Bran Clusters and the Oats & Caramel bars. Yummm. The cereal was fantastic, with the lightly sweetened flakes giving the milk a great flavor. The kids all asked for seconds. So poor me only got one bowl. I chose not to share the Oats & Caramel bars. Mine, mine, mine, mine! Those were a fantastic quick breakfast after a workout! Mandatory entry: Post a comment telling me which products you think you would get with the VIP coupons. Entries will be accepted through midnight MDT on November 10. I will use random.org to draw a winner sometime on Veteran's Day. If I cannot figure out how to contact you, or you do not respond within 48 hours, I will draw a new winner. Disclosure: Fiber One and MyBlogSpark provided me with the free prize pack, and the gift pack to give away. No other compensation was received, and I was not required to write a review, much less a positive one. The Oats and Caramel bar is what grabbed my attention. I'd like to get Fiber One Honey Clusters and Oats & Caramel bars. I would get Honey Clusters and the oats & chocolate chewy bars. I think I would try Oats and Caramel cereal and the Oats and Caramel bars. Or maybe that's too boring and I might get the oats and chocolate bars. Hmmm... Also, I am already a follower :). I would try the peanut butter bar, I've had the oats & choc one and it is yummy. I am always open to new cereals so maybe try the honey clusters one too. I would definitely want to try the Oats and Chocolate and Oats and Apple Streusel! Yum! I would get the oat & peanut butter bars & I like the original Fiber One cereal. I am already a follower post #1. I am already a follower post #2. I think I would get the chewy bars. These sound like a great snack to have on the way home from piano lessons. The raisin bran is my choice. The honey clusters one sounds yum! Now...pick me, pick ME. LOL!